The Monastery – French Lavender. This scent is one of the most natural and aromatic perfumes that nature creates. When I visit a Monastery in the South of France I always leave with as much of their lavender produce as I can. Somehow French Lavender really does feed my soul. Our honey fragrance is named after the beautiful Californian coastal city of Monterey which is a safe haven for nature. Their bay is host to many species of marine animals such as dolphins, seals and otters. Their flora and fauna is extremely varied and their honeybees make delicious honey! Did you know that the name Mellissa means Honeybee in Greek? Garden Memories, our rosemary fragrance, is a true classic and one that brings with it memories of the sun warming up our rosemary bushes in the Summer. I love to go outside and snip off a branch or two to add to our meals, almost always alongside lemon. Its powerful and aromatic scent is just so relaxing. The quintessential Christmas scent! Inspired by the author Alexander McCall Smith, we tried to create a scent that would inspire creativity and guide you through your imagination. The Writers Nook is a spicy and evocative scent of cinnamon, orange zest and clove. We wanted to make a fragrance that took everyone back in time to cosy, candlelit winter evenings, reading in front of an open fire. Our new scent Émilie du Châtelet is a fresh and fruity perfume with notes of freesia and pear. It is a wonderful scent to welcome a new Spring. Lex named it after reading a biography of female mathematicians and Émilie du Châtelet was a truly inspiring woman, whose character jumped out of the page. She was not only a gifted mathematician but also a physicist, philosopher and author of many acclaimed academic texts. The philosopher Voltaire was one of her lovers and once wrote of her that she is “a great man whose only fault was being a woman”. There have been and are, many great female scientists achieving insights into science and philosophy in the last 300 years but unfortunately things have not changed all that much and we tend to just hear about the great discoveries of their male counterparts. Let’s change that and encourage more conversations and awareness of great women! Also available as a reed diffuser. 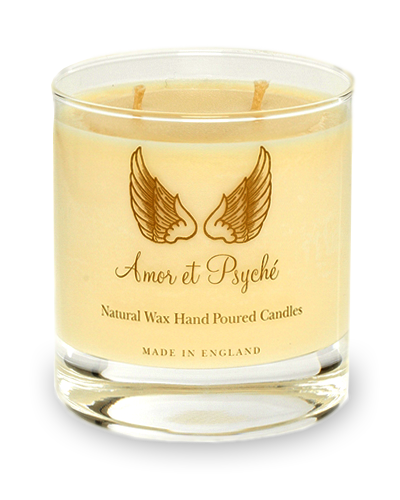 Named after the Latin word for Lovers, our Amatores scent is pure scent of Ambergris. Present in many perfumes as it helps other scents interact with each other, Ambergris is made by Sperm Whales. Once it has left the whale and dried out, its sweet exotic scent becomes one of the most highly sort after products used within perfumery. Our Ambergris is the only Amor et Psyché scent made using no natural products as the production of Ambergris is illegal. Amatores is a perfect present for your Valentine or a loved one. Cedar is a genus of tree that is highly fragrant. Some Cedar can be used for making furniture or building houses and others for their highly fragrant perfume. Patchouli belongs to the mint family. It is a fresh but heavy scent and therefore compliments the powerful Cedar very well. In the 17th century Chinese traders used Patchouli to protect their silk from moths. Together Cedarwood and Patchouli create a roasted wood perfume. As recommended by Harper’s Bazaar. Our Jasmine scent is named after Icarus – the boy with wings made of wax and feathers. Jasmine is intensely floral and its flower has healing properties. It is not easy to extract the scent from a Jasmine petal, you must use a cold-distillation process to preserve the perfume. Jasmine is used as a middle note in our perfume Cupid. Our Mizaru scent is named after one of the The Wise Monkeys. Thought to originate from Japan, the pictorial maxim conveys the proverbial principle of See No Evil, Hear No Evil, Speak No Evil. Sandalwood is deeply rooted within many Eastern cultures for both medicinal and religious uses. The sent of Sandalwood is extracted from the base of its trees. Sandalwood trees are endangered due to their high demand. In Nepal and India Sandalwood trees are government-owned to protect them but the trees are often stolen and sold illegally. As we do not use essential oils we are not damaging the dwindling numbers of Sandalwood trees in the world. Our perfumers use molecules to replicate the scent exactly. Enjoyed by Leonardo Dicaprio, Lady Gaga and sporting champions, our Orange Blossom & Magnolia scented products are named after the great Roman poet and philosopher Ovid. Enjoyed by international singers, actors and sporting champions, our Ovid is a delicious blend of spicy orange blossom and light misty magnolia to symbolise purity of heart and love of nature. Orange Blossom infuses its citrus scent into food deliciously. The Spanish often use it to make tea. Blended together, orange blossom and magnolia produce a scent that is so distinctively floral yet with strong undertones of bitter sweet citrus. A sweet and sensual mix of Vanilla and Sandalwood makes this scent a pleasure to burn any time of the year. Sandalwood is deeply rooted within many Eastern cultures for both medicinal and religious uses. The sent of Sandalwood is extracted from the base of its trees. Vanilla is an Orchid originating from Mexico. It is used widely within perfumery and cooking for its rounded scent and sweet flavour. Orchids are symbolic of strength, love, beauty and luxury. Qi is the ultimate Christmas scent but it suits all seasons. Frankincense and Myrrh is used within Chinese medicine to move the blood and the Qi – energy – around the body. Two thousand years ago Frankincense and Myrrh were trade by the Nabataeans as they were worth more than gold. Their incense was obtained from trees located in the southern part of Arabia. Qi is the ideal candle for winter time. It is a perfect blend of two scents that enhance meditation and relaxation. An absolute must for cold nights in front of the fire. Sweet Myrrh is also known as Opoponax. Opoponax is used as a base note within our perfume Cupid. Songbird is a beautifully fresh and distinctive blend of sweet wild berries and freshly cut roses, Songbird symbolises protection, poetry and love. One of our most popular scents! Rose of May is used within our perfume Cupid. Our Tuberose scent is named after Pannychis the Goddess of nighttime parties and festivities. She was one of the attendants to Aphrodite. The Tuberose flower symbolises desire and forbidden pleasures. Queen Elizabeth I favoured the Tuberose and this is perhaps the reason for its noble connotations. Tuberose originates from Mexico but today it is mainly cultivated in Southern India and often used to worship the Gods. Tuberose only blooms once a year and always at night. Its cultivation requires infinite care. Tuberose’s imperious fragrance is considered the most powerful in the floral kingdom. It emits a sweet, heavy and creamy perfume, which deepens after twilight and a scent that is said to bewitch the perfumer. Tuberose is used as a base note within our perfume Cupid. A Jokoban, meaning The Constant Incense Board, is an ancient and ingenious form of timekeeping. As the hour changes so does the scent. Jokobans are skillfully handcrafted, lacquered, wooden boxes. The Japanese traditionally burnt Agarwood, Apricot or other native scents but AetP have chosen Rose Geranium for its fresh yet romantic and powerful scent. Rose Geraniums symbolise love and hope. Lily of the Valley, also known as Eve’s Tears, is a poisonous plant to humans if ingested, yet one that yields a rich and most intoxicating scent (in a good way). It symbolises bad turning into good, the resurrection of humility and love. Like Neroli, Lily of the Valley is a popular flower within bridal bouquets. The Quill is our scent free candle. Simply a pure organic candle. Perfect to light when you need no distractions or when you are within smaller spaces. Especially ideal when reading, writing or eating. The Quill is a favourite amongst expectant Mothers as there is no scent to disrupt their senses at such a sensitive time in their lives. It is therefore a great baby shower present! Amber is fossilised tree resin. This treasured orange coloured fossil is found all around the world. No piece is the same as another. It is often worn as jewellery, being very light-weight and soft compared to other gems. Oil of amber is used within perfumery. It is symbolic of eternal youth, healing and eternal bonds. Vanilla is an Orchid originating from Mexico. It is used widely within perfumery and cooking for its rounded scent and sweet flavour. Orchids are symbolic of strength, love, beauty and luxury. Amber is used as a base note within our perfume Cupid. Our Earl Grey scent is named The Raconteur. A Raconteur can be described as a poet or dandy and the Bergamot within Earl Grey tea is often used within perfumery to bind scents together or to close a perfume. Native to Southern Italy Bergamot is a citrus fruit that produces a flesh much too bitter to enjoy raw but a rich green/yellow rind full of essential oils so perfect for the making of perfume. Its scent is refreshing and we love it on its own just as much as when it is hidden within a perfume. “Keep love in your heart. A life without it is like a sunless garden when the flowers are dead”. Oscar Wilde. Bergamot is a top note used within our perfume Cupid.